Gillette, the shaving brand owned by Procter & Gamble (P&G), has unveiled a major outdoor push as part of its 'Great Start' Olympic campaign, featuring brand ambassadors Sir Chris Hoy, Liam Tancock and Tyson Gay. The campaign, by Abbott Mead Vickers BBDO, has erected ads on three tower blocks in Stratford overlooking the Olympic Park. The location has been chosen to maximise the campaign's awareness to traffic running to and from the Games. Logistics and installation was by blowUp media. The outdoor push is part of Gillette's overall 'Great Start' campaign, which launched earlier this year. It aims to celebrate sports coaches and inspire young people to get involved in the coaching profession. 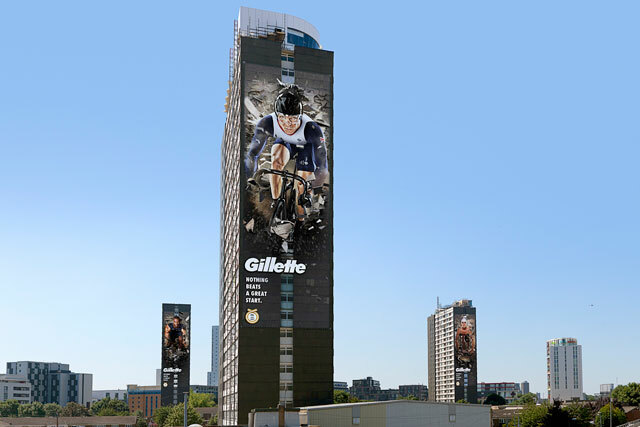 Jared Regan, Gillette brand manager at P&G UK & Ireland, said: "Visible from miles around and particularly for the millions who will be in Stratford in the coming weeks, spanning 1,620 metres square, this is the largest single viewed advertising opportunity in the UK. "Our agency teams have delivered a real masterpiece that brings our Gillette Great Start campaign, with our fantastic ambassadors, to everyone in London." Gillette released a report as part of the coaching campaign, including information from: Sports Coach UK; British Olympic Association (BOA); United Kingdom Athletics (UKA); Hugh Roberston MP; the minister for sports and the Olympics and Gillette ambassadors Jonny Wilkinson and Brian Driscoll. Gillette has partnered with Sports Coach UK to sponsor a number of coaching qualifications by awarding "Great Start" grants throughout this year, with applications submitted through the brand’s Facebook page, www.facebook.com/GilletteUK. The 'Great Start' campaign reflects P&G’s overall commitment to raising funds for sports youth programmes across the globe, revealing plans to raise £3.3m over the course of this year to establish and sustain youth sports programmes around the world. The money is being raised through donations and a portion of sales of the company's leading brands, including Gillette, alongside Pampers, Tide and Pantene. Do brands fear sport events?